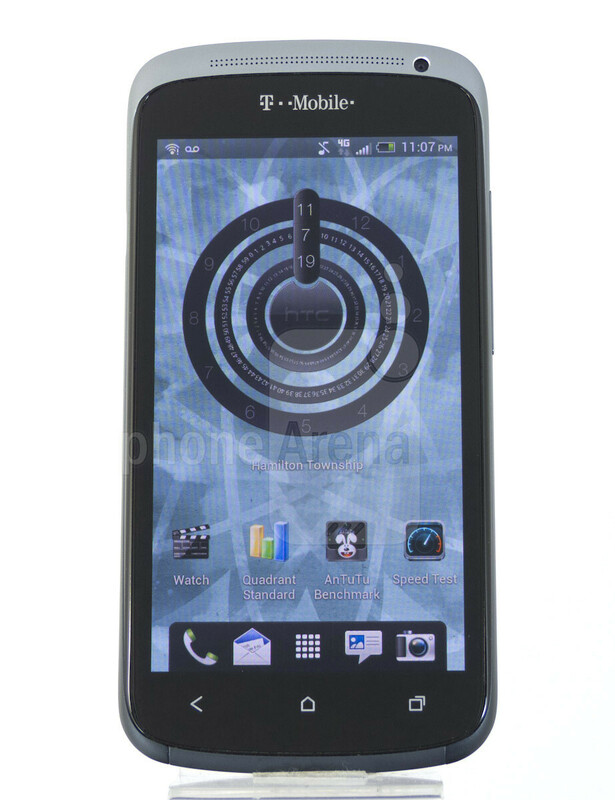 Strangely, it’s been a while since we’ve seen a top-shelf Android powered smartphone for T-Mobile. Yeah, the carrier has been blessed with quality devices such as the Samsung Galaxy S II and HTC Amaze 4G, but they’ve been available for some time now – with nothing particularly “fresh” put out by them in the last few months. 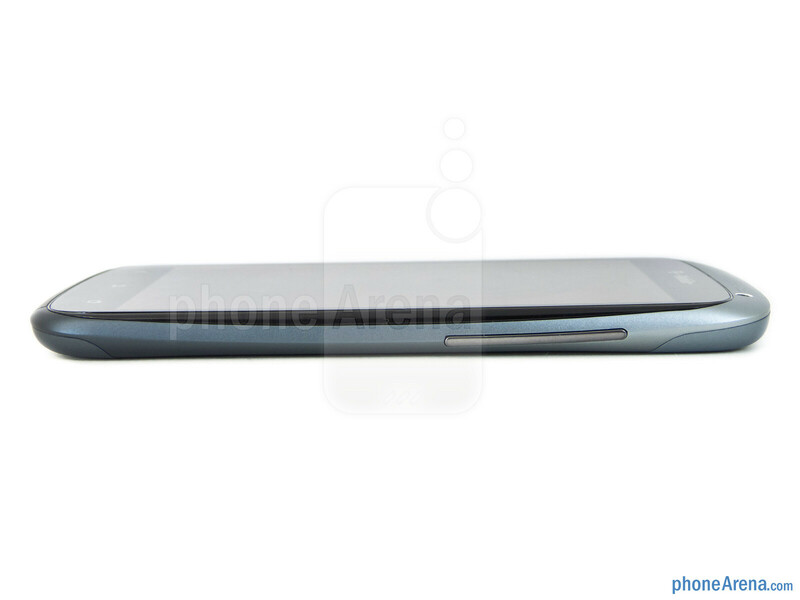 Now that spring is in full swing, the wait for something special will soon be over, as the highly anticipated HTC One S is set to shake things come April 25th. Over the big pond, our friends in Europe have been taking pleasure in experiencing the beauty and wonder surrounding the middle child of HTC’s One family. 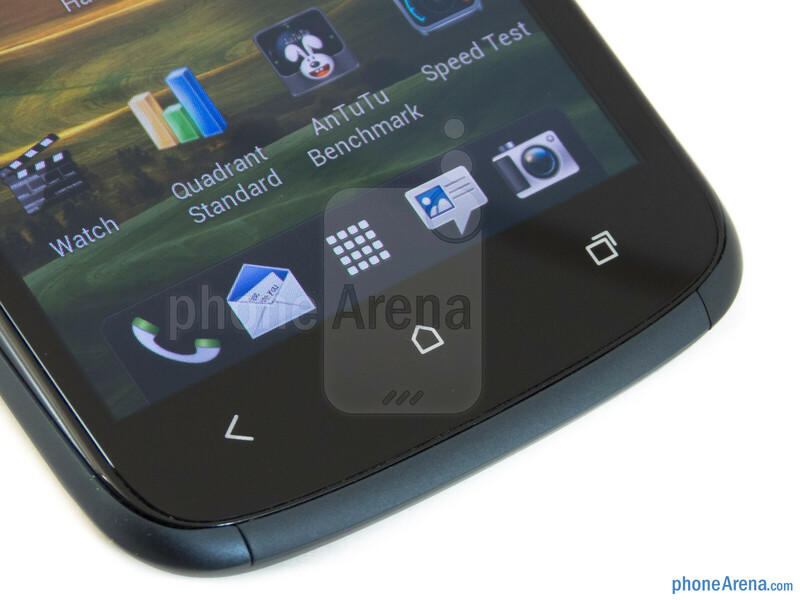 And soon enough, T-Mobile customers will be able to partake in it as well – thus, delivering a device that boasts the most up-to-date version of HTC’s Sense UI on top of Android 4.0 Ice Cream Sandwich. 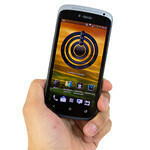 Priced at $199.99 with a 2-year contract, some might question and wonder if it’s valid enough to accept wholeheartedly, even more when Sprint’s beefier HTC EVO 4G LTE is confirmed to flaunt the same price point. Regardless of that, let’s dive in and find out what all the commotion is all about surrounding this bundle of joy. 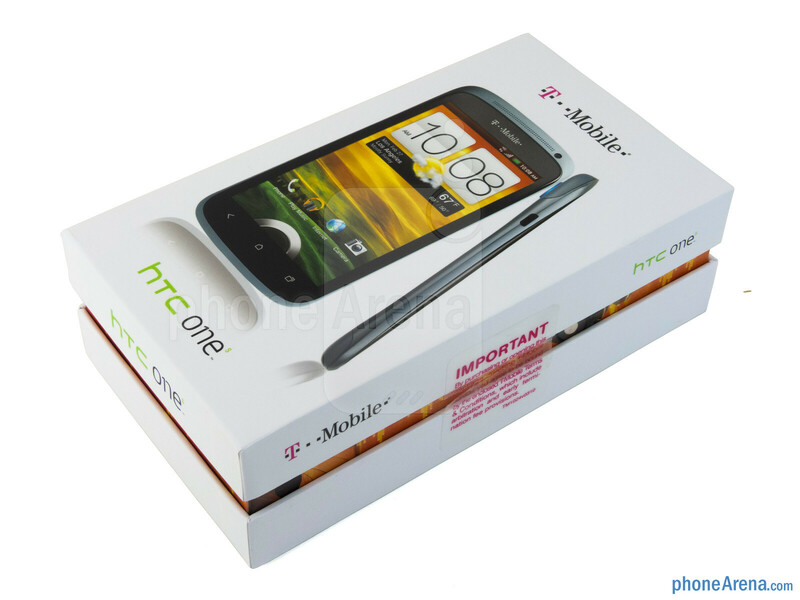 Simply put it, T-Mobile’s version of the HTC One S is an exact facsimile to the European one we reviewed recently – well, the sole difference is the T-Mobile branding it’s sporting below its earpiece grill. Aside from that, the anodized aluminum unibody design of our review unit remains intact to the tooth, and more importantly, it’s remarkable that HTC has managed to produce something so skinny (0.31” thick) and lightweight (4.22 oz) without compromising its choice of materials. Of course, we’re mesmerized even further by its streamlined construction, though, its overall styling reminds us of a pancaked Google Nexus One – since it employs some familiar design traits from the original Nexus. Overall, it’s extremely comfortable to hold in the hand, thanks to its chassis boasting a fairly narrow and elongated profile. Without question, we’re blown away to by the compact look for a device donning a large 4.3” display, and easily makes previous offerings like HTC Amaze 4G appear spaced out and chunky in overall size. All in all, the HTC One S is just one of those devices that looks beautiful as a rendered image, but as it makes its transition to a physical object for us to hold and touch, we’re emphatically impressed to see the wonder and intrigue still intact. 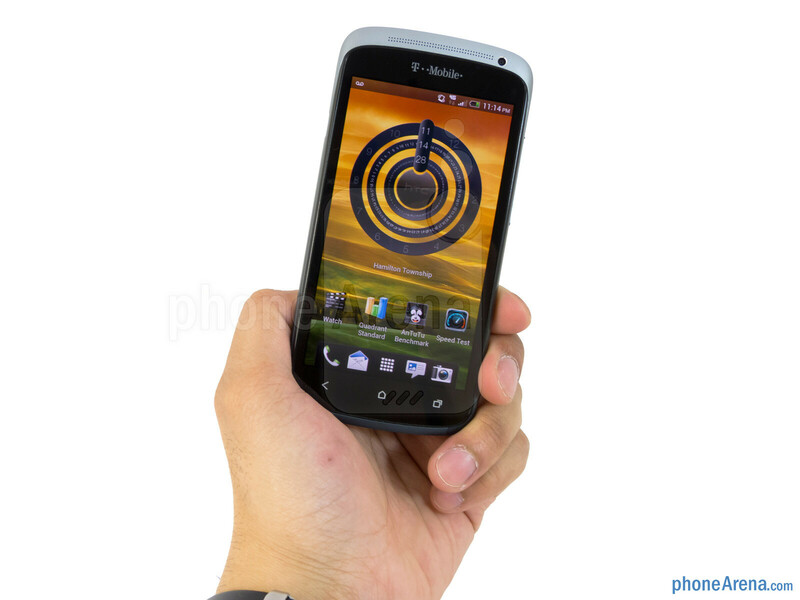 Becoming a standard with HTC’s set of Android smartphones, the One S opts to employ a trio of capacitive buttons beneath its display – as opposed to being a part of the interface, much like other ICS devices. Above the display, micro dots line up in unison for its narrow ear piece grill, while a front-facing VGA camera sits next to it ready for those occasional video chatting sessions. Unfortunately, its dedicated power button and volume rocker are a tad bit too flat for our liking, but at least they exhibit a reasonable amount of tactility when pressed. 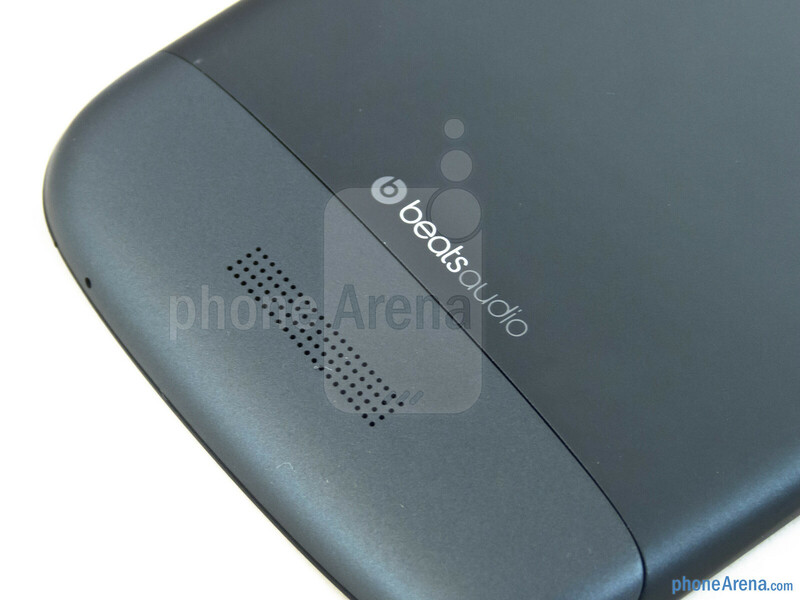 Also, around its sides, we find its noise cancelling microphone, 3.5mm headset jack, microUSB port for charging/data connectivity, and standard mic. 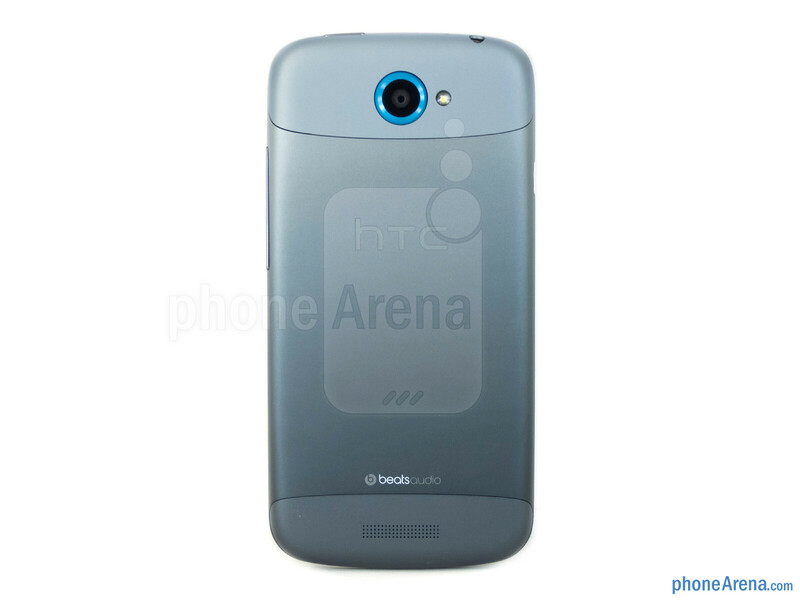 Around the rear, its 8-megapixel auto-focus camera juts out from the surrounding surface and its lens is outlined with the same blue accent. Being one camera friendly device, it features an F2.0 aperture lens, backside illuminated sensor, LED flash, 1080p video recording, and the ability to snap photos while shooting a video. 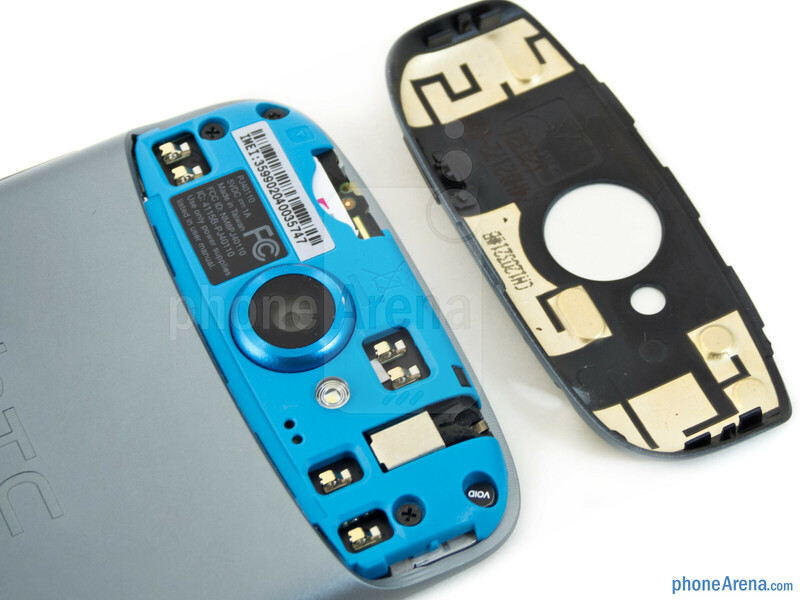 Prying off the top plastic cover surrounding the camera, we gain access to its microSIM card slot. On the opposite edge, another set of micro dots converge together to forms its speakerphone grill. 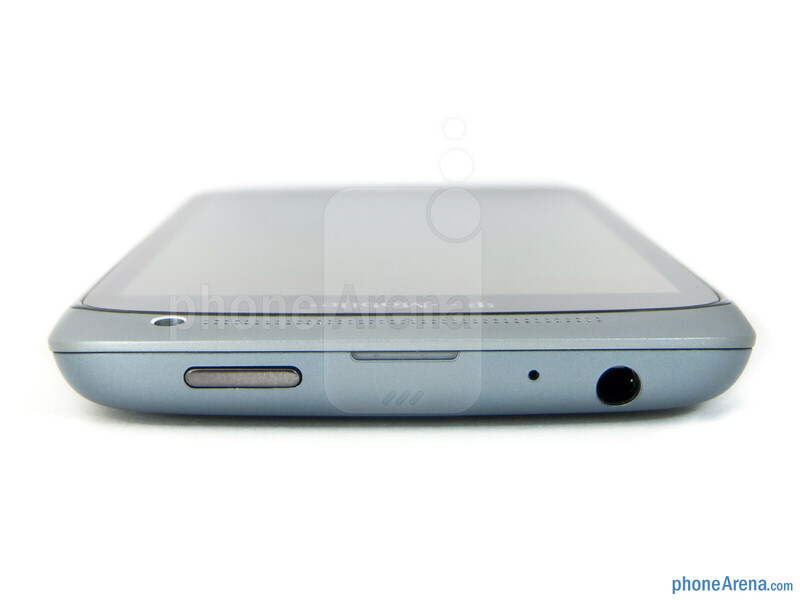 Just a reminder to you folks, this beauty lacks both a removable battery and expandable microSD slot. 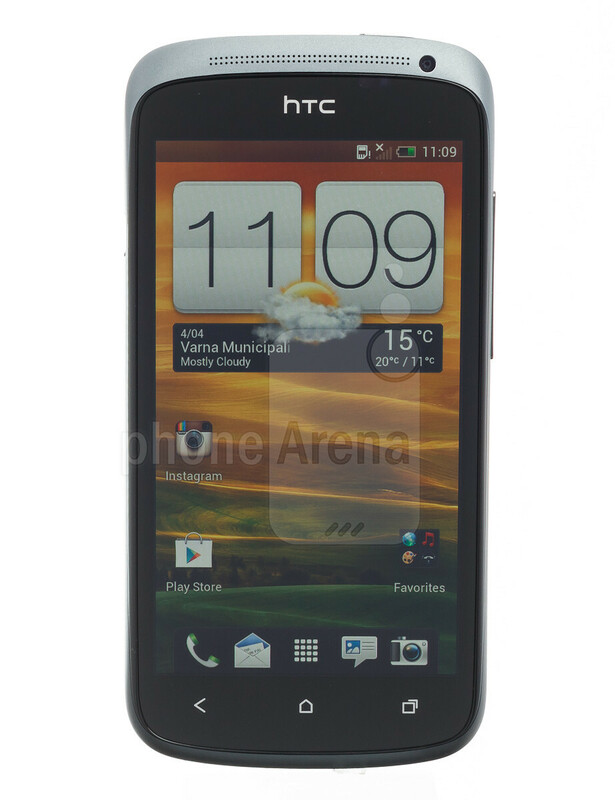 Indeed, it’s not as awe-inspiring as the display on the HTC One X, but nonetheless, the 4.3” qHD (540 x 960) Super AMOLED capacitive touchscreen of the HTC One S is an appreciated upgrade when compared to the previous offerings available with T-Mobile. Being an OLED variety, we’re treated to the usual set of visual eye candy normally associated with this kind of panel – such as wide viewing angles, cooler looking colors, and a high-contrast level. Despite utilizing the PenTile RGBG matrix arrangement, which is noticeably evident with the icons and text located in the notifications area, we’re humbled about being able to discern most things without any problems, even more when it coughs up a respectable pixel density of 256ppi. Having been spoiled by HD displays, it’s obvious that we’re not going gaga over the HTC One S, but rather, it’s still a pretty one to look at when it comes down to it. John, any news about out of contract price? Not even stock HTC earbuds? It's bad enough they took away the Beats, but now you don't even get ANY earbuds? That makes me sad. I get it was mostly just marketing, and the Beats buds aren't really that great in quality, but still. Agreed, atleast throw in some $2 headphones if you're going to claim to be music oriented and team up with Beats. Nobody wants that gray/blue with neon blue color scheme. The black one looks 100 times better. And we have to wait all the way to June to get that. 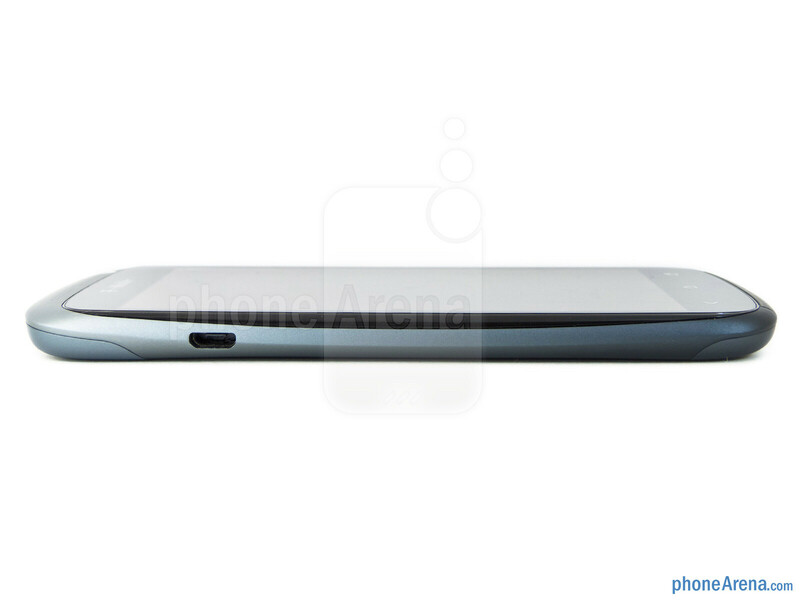 But I'm willing to wait, this phone is pretty exciting with the speedy 28nm S4 dual core. THE POWER! And I'm getting tired of my concave sensation 4G display. It's like my thumb can never reach the edge because of that curve. I love it and had till i found out.... NO BEATS AUDIO EARBUDS d-__-b or any earbuds!!! 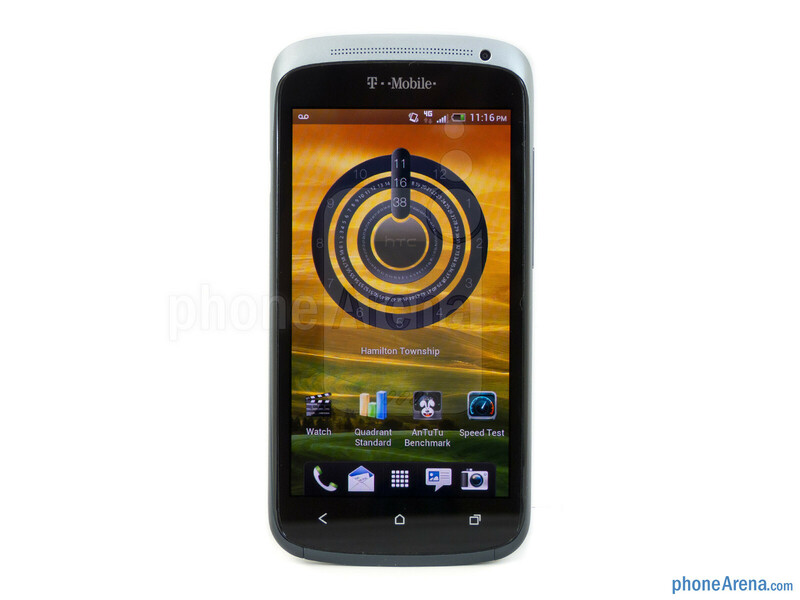 Gosh my lg optimus t is nothing compare to this and YES IT BROUGHT eardbuds!!! But it has an amazingly fast processor, upgraded camera, and more vibrant display. And the pentile isn't really noticeable to the untrained eye without a magnifying glass. I have had the Galaxy Nexus since it launched. 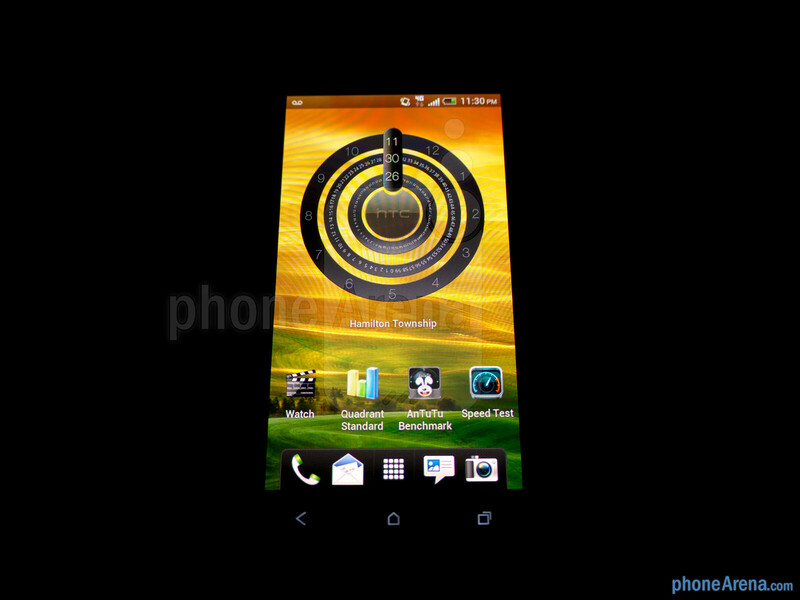 I also had the Droid 3 for a while. Comparing the normal LCD pentile display vs AMOLED pentile display is a HUGE difference. You will not notice the AMOLED one even if you try your best to look for it. 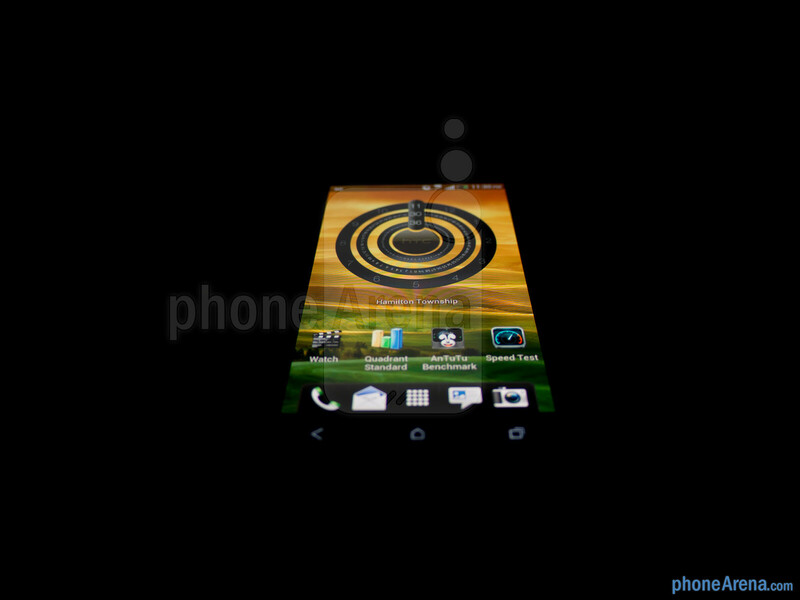 Galaxy Nexus/Note owners never complain about the pentile displays or at least from what I have seen. So check for yourself before you write it off. Yes, you have the software and the option for extended battery life and memory, but my point about the hardware still stands. Some people don't need the more battery, or more memory. Granted it's still always good to have the option, they made this phone in mind of the average user. Not the power hungry user, or the memory hog, the AVERAGE consumer. And the average consumer's main priorities are speed and looks. And this phone delivers that speed and (arguably) looks better than the Sensation ever did. 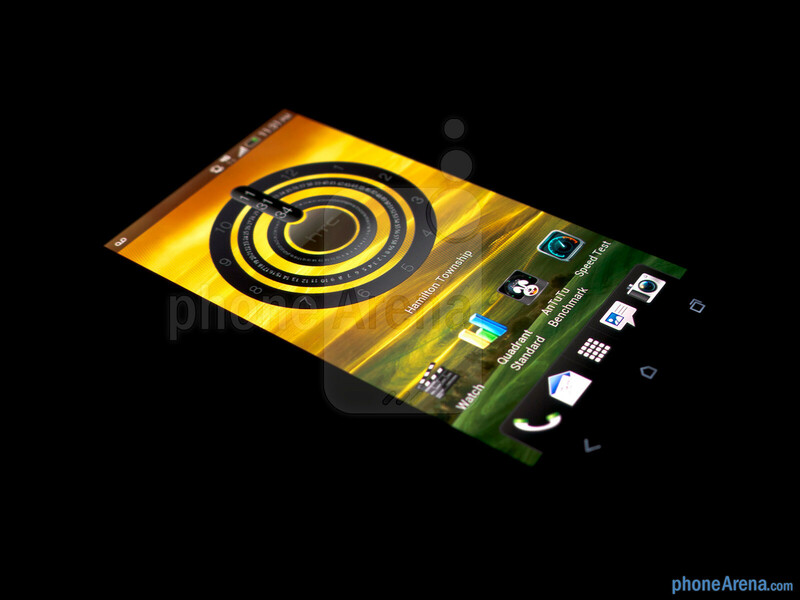 People love the vibrant Super Amoled screen, because its more eye candy to the user. People want faster processors, because they don't want lag like the S3 had. The One S has everything the average consumer asks for, it's pretty and fast. Don't get upset because the manufacturer didn't fit your standards, because majority rules, and not as many people cared about battery and memory as other people cared about speed and beauty. The S4 chip should get close to 40-50% more battery life than the sensation which had HORRIBLE battery life Amoled with pentile BLOWS AWAY the sensations screen. dont get caught up on pentile or not.. you can not see the pixels. Ive had pentile for 2 years on my SGS1 and i still stop and stare at how pretty it is. the S4 processor is WAY faster than the 1.2ghz S3 processor per clock it has nearly double the ram for faster and more smooth operation. you can get the software.. but you wont get the hardware. 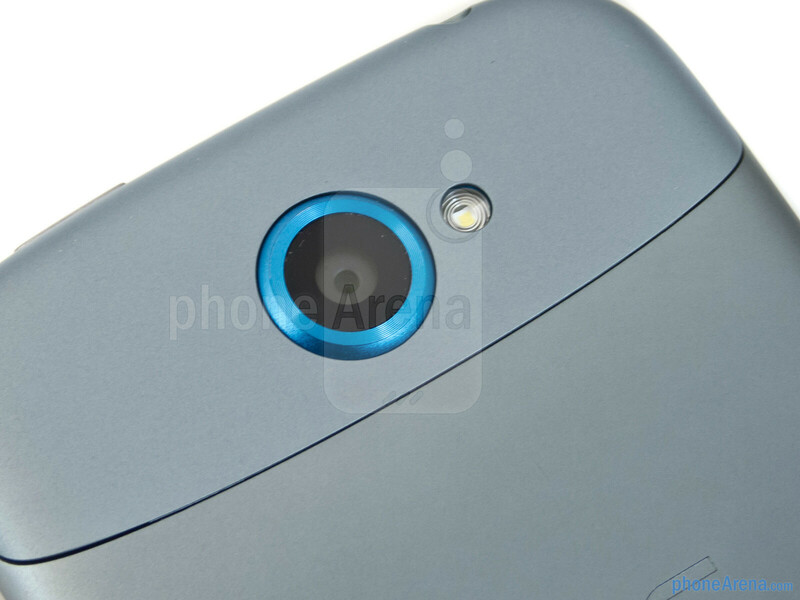 The OneS has dedicated camera HARDWARE that makes it work. The sensation is software only. In no way other than removable storage is the sensation superior to the OneS. Now if you are just holding out for something that appeals to you, sure.. but dont act like this is a downgrade when its far from it. I'm skipping it too, but thats because I know something 2x as good is right around the corner. the funny thing is the dual core s3 is still only slightly more powerful than the vibrant.....you ever compared a sensation to a galaxy s2? much much more powerful phone than your sensation. The One S is no different it is much more powerful than your sensation, but yes i agree with you on the subject of the expandable memory, but on the screen no qHD is plenty high enough to not be able to detect pixels unless your purposefully looking for them (why would you?) I can almost guarantee you at least 75% of normal consumers would choose the qHD amoled over the qHD s-lcd on your sensation because people are more attracted to the vibrant colors. The Galaxy Note gets a 7/10, The One X gets a 7.8/10 and the One S gets a 8? I don't understand PA's review process. depends on the reviewer.... I like John V. His video Reviews are the best on PA.
Of course, one person's dislike might end up being a positive for another individual. In general, you have to be impartial, even if the device in question isn't something I'll be personally buying. As I've said, I question the $200 price point, but I'm sure that's not going to stop people seeing it performs well and has one killer design. Glad you like it though! I have respect for reviewers as they must try and see things with other eyes while giving their opinion about it. its hard and needs lots of time for practice. Different people. They lean towards their own preference. John is more balanced with everything, Ray is just... idk. Ray did the review for Note and One X, and alot of people think he's really against Android because of the low scores he gave them because he wasn't open minded. He judged them mostly by his own preference. John did this review, and I say its fair, he lists both good and bad things about the device, and scored it according to what the average person would want. If I'm not correct and please feel free to correct me but I believe RAY S reviewed the Note and we all know how much he loves the iPhone and loves it's size. So it's no shock whatsoever that he would downrate it due to it not being a "one handed device". That's his view and I respect it but look at it this way. It's one of the most desired and loved devices for a reason. I don't even care about phone ratings anymore, it's always somewhat biased. Everything is biased in someway. Nothing is ever truly fair. RORY: Whether he uses an iPhone or a Droid X; the Note is simply huge. 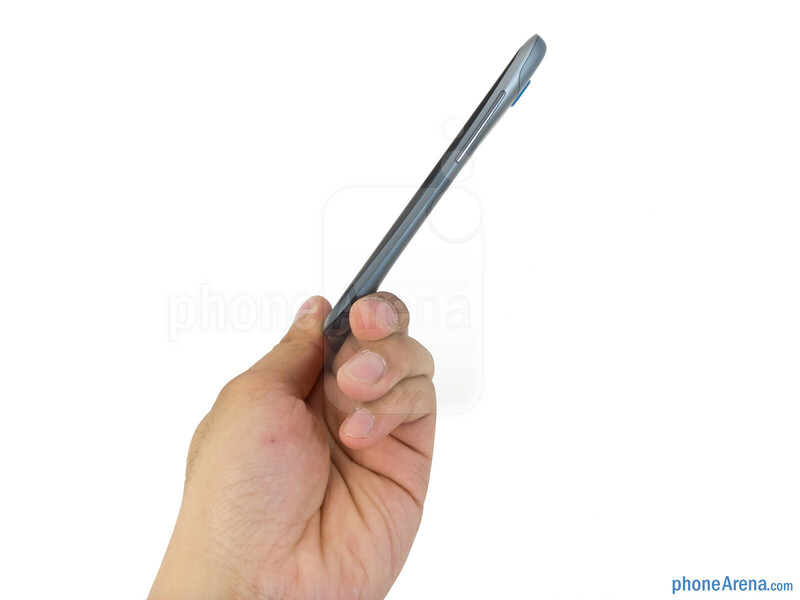 Almost no matter what phone you are coming from is going to be significantly smaller. That's a fair con. I checked that phone out at best buy one day and personally, idk how anyone could use that as their daily phone. I would think him unfair if he didn't list that as a con. True but you can't have a PRO to the massive display and a CON as the device being too big. That just doesn't add up. Instead of evening it out, it will simply marked down big time because of its size. When most people either work past the size or eventually start to like it.